I'm an indie author and editor from Michigan, and I publish my work under the imprint, Blank Paper Press. I'm also a co-founder of Indie Blu(e) Publishing, based in Pennsylvania. It’s always been a dream of mine to help other writers find their voices and achieve their goals. In 2017, I published my first novel, inspired by my relationship with my mother, titled Magpie in August; the story of Magpie began to take shape in 2014. I gave my mother a copy on Mother’s Day—she never finished it. She passed away suddenly five months later, and I dedicated my first collection of poetry and prose, Constant Muses, to her. While preparing for the 2018 summer release of my second novel, For You, Rowena, I pieced together a diary of sorts that would become TWELVE. Writing this book for my mother was an incredibly cathartic experience, and though I’m proud of the work I’ve produced, TWELVE is something I never wanted to write. In addition to poetry and fiction, I write essays and educational articles for the Ohio Mansfield Pride annual magazine. I also use my platform to advocate for survivors of domestic and sexual abuse. My greatest writing inspirations are Plath and Poe. I can recite every line of Tombstone. I think Step-Brothers is the funniest movie. Ever. I’m good at public speaking, but awkward on camera. What can I say? Twelve by Kindra M. Austin is the most powerful thing I have read in recent memory. It may be the most powerful collection of poetry on the planet. It is real. It is honest and devoid of the pretentiousness of most poems and prose I have read. It is bottled grief and I advise you to think about what you may be getting yourself into before you uncap it. I don’t know how or feel qualified enough to judge it or even tell you why I love it. All I can do, with complete honesty and integrity, is tell you to read it. I’m talking to everyone. Read it. Come to your own conclusions about its brilliance and truth. You may not see it the way I see it. That is the beauty of poetry…and people. But I would be very surprised if you are not moved in a very profound way. Let’s be real. Not everybody loves their mother. Some of us are not capable of it. Some mothers don’t deserve love. No, not everyone loves their mother, but everyone wishes they had a mother that they could love like Kindra M. Austin loves hers. Her words make me jealous. They describe something real that most people only know as an unattainable ideal. I Can Love September, Alcoholics Anonymous, and My Love, I Will Die For You were the three individual poems that resonated with me the most. I’m sure everyone will have their own favorites but I am equally as sure that there will be something for them in this beautiful tribute to a very missed mother. I had the honor of reading an advanced copy of Twelve for review purposes. Austin has created a whole new language for mourning in Twelve that is sharp, raw, and beautiful. Anyone who has lost a loved one unexpectedly or had to negotiate the dissonance of having a part of their identity ripped away suddenly by death will feel the stab of truth in every word. I devoured Twelve in one sitting, but already long to return and savor each piece more slowly, with the reverence they deserve. Twelve is one of my favourite collections of the year. It ranks up there among one of the most heartrending collections I’ve ever read. This is because Twelve’s airtight narrative of bereavement gives you little breathing room against the barrage of Austin’s grief over the death of her mother. "You come to me often, and I can’t take it—seeing your Cheshire smile, and glittering eyes. I’d thought dreams of you would bring me peace, but those visions of you animated, and the dulcet tones of your voice, well-remembered, bouncing against the walls of my skull only cause me agony." And this is not a beatification. There is a sad acknowledgement the relationship at the book’s heart was conflicted and imperfect, like any parent and child have. Yet, Austin comes out the other side more fond of her mother’s memory than not, and hopeful for the future. Nowhere is this more appropriate than Wedding Poem, which celebrates her newlywed daughter- an event Austin mentions in the fantastic opener Proem should have included her mother. The imagery is bleak at times, but death and grief are not pretty affairs. It is Austin’s sheer command of the written word that bleak imagery is, in fact, imbued with more hope than hopelessness. Overall, Twelve is a collection which reminds us death is not about the dead, but those who are left behind. In Austin’s case, she has shaped it into a torch carried for hers, and wields it to light the dark ahead. I had the pleasure of reviewing this authors work prior to publication. 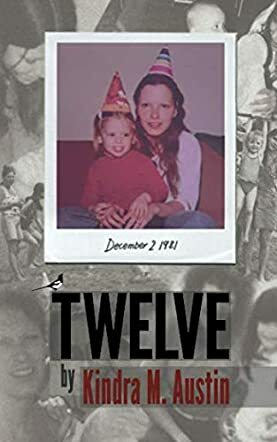 Twelve contains the power you'd expect if you are familiar with this author's previous work, but it takes the emotion even further in the twelve months leading up to and subsequent to the author's mother's death. To say this is a book about recovery does not in any way do justice to the sheer guts and honesty you will find herein. This is a collection like none other, the only point of comparison I can consider is Joan Didion's A Year of Magical Thinking but even then, it's far less unapproachable and far more intense than the usual suspects in these kinds of emotional journeys. In fact, to say it's a journey doesn't really liberate the truth sufficiently. This is an exodus through emotion rather than a collection of emotions, there is the unbearable awareness of what has happened and then there is survival and everything else, it just stands starkly at the side and watches without knowing what to say. That the author has the capacity to wrench this from her heart and put it into prose and poetry, astounds me. Few if any have been able to capture what this experience is like (of losing someone close to you to premature death) and I don't see how it can be done, and yet it is by Kindra Austin is quite simply is a force of passion and love and pain and life and all the things we all are but can never say. She is also more than that, because she's fearful and fearless, humorous, moribund and terrifyingly real and her words will disturb you, make you think and most of all provoke a deep ache. What is that ache? It is the proof you are alive. I am in awe at Twelve. Every time I read something new from Kindra M. Austin I am in disbelief that her writing can be MORE truthful and captivating than the last. She has something very powerful here. I promise it will be a book you won’t want to put down. This book has just left me wanting more poetry from Kindra . It takes you to her core and let's you see something we can all relate to in some way. Get this book !! Another excellent collection of poetry and prose by the talented Kindra Austin. This volume chronicles the 12 months following the death of Austin's mother. While not every piece deals directly with the loss of her mother, it's a loss that lurks behind every word. As with her first collection of poetry, Twelve is incredibly moving, hauntingly beautiful, and rawly personal. For me it was also very timely as my own mother recently passed away and, while our relationships with our mothers certainly seem to have been different, Austin's poetry definitely spoke to me with it's authenticity and truth.